A look at goings on in October 2013. 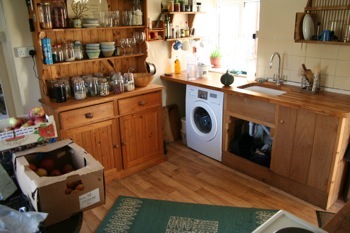 …changed to something warmer and pretty by late September. It happens every year but still it surprises me how quickly the days shorten at this time of year, with nights now longer than days and growth slowing fast. 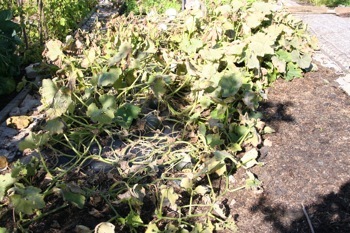 Some larger plants can make worthwhile new growth in October because they are adapted to cooler conditions and have such an extensive root system and leaf area – kale and many brassicas, celeriac, leeks – but summer plants are fading fast and it is time to harvest squash, beans for drying, and the last outdoor tomatoes and cucumbers. 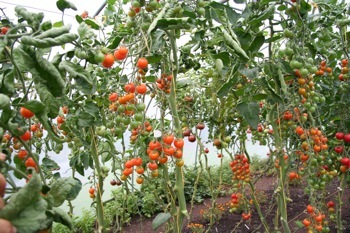 Indoor tomatoes can continue ripening for another two or three weeks. 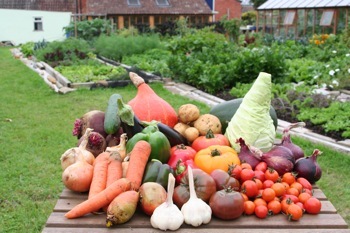 Harvest festival of late summer vegetables with their warm colours. 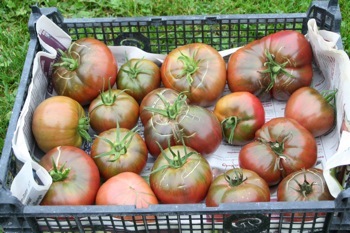 Black Russian tomatoes from the polytunnel. 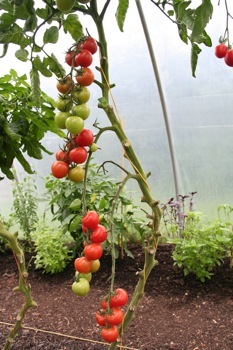 The tunnel tomatoes have been superb all summer. 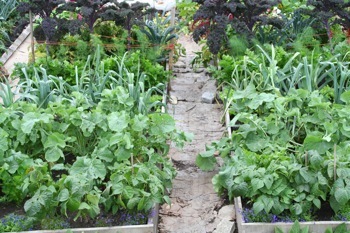 Matina in front and Sungold on right. 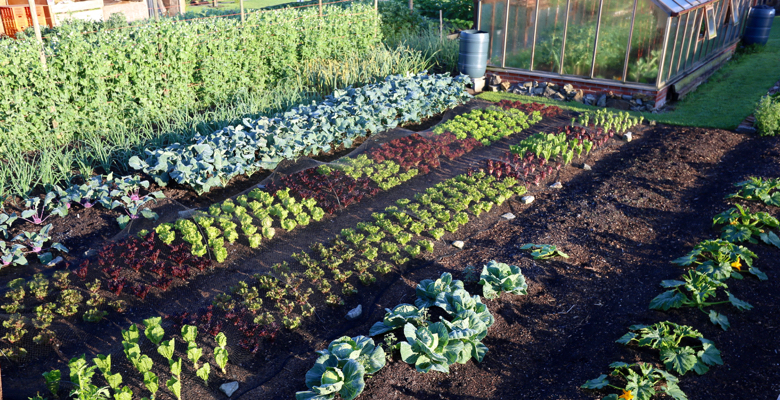 After clearing plants and any weeds, you can spread compost and manure to feed soil life and so that winter weather can turn lumpy compost into a friable surface for spring sowings and plantings. Also it is a good time to plant garlic, your own if you have it, then spread compost/manure on top after planting. 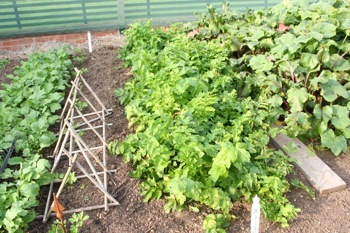 Don’t sow broad beans yet or they will grow too tall before winter, which makes the stems susceptible to frost. 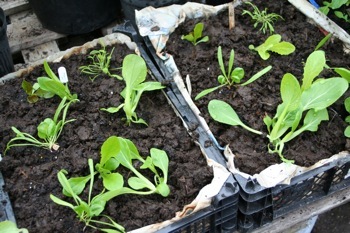 Now is too late for sowing winter salads except possibly mizuna. I hope you have some seedlings growing or already planted, so they can be established as small, sturdy plants by month’s end, before any really cold weather arrives. 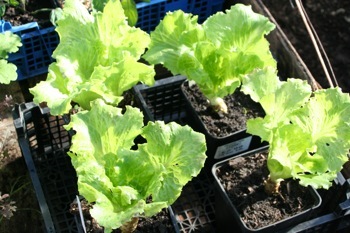 I made a late sowing of Grenoble Red lettuce in the greenhouse, from my own seed off an outdoor plant which I sowed last September: I find the vigour of home saved seed helps it to catch up if sowing late, but generally it is more reliable to save lettuce seed undercover, especially in wetter parts of the UK where damp, autumn weather can cause rotting of the lettuce flower-heads. Now that air is humid and rain more frequent, slugs have reappeared in numbers and I have been doing many evening patrols with a torch and knife. My garden still has a high population of molluscs after being a weedy pasture only a few months ago, and I have been lucky that summer was dry enough to discourage slug breeding and limit the damage. 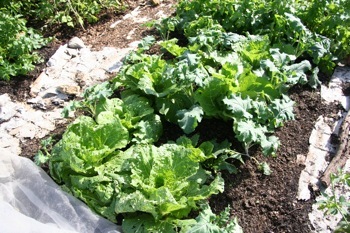 One way to reduce slug numbers is by removing old and yellowing brassica leaves under cabbage, broccoli and kale. This gives them less moist habitat and less old leaves to eat. Also you can take some lower leaves off endives and chicories, or just pull the leaves back to cut or remove the lurking molluscs. 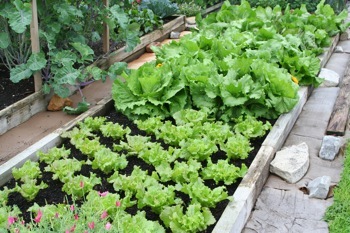 Similarly, regular picking of salads helps to limit slug damage because they have less leaves to hide under, and having no weeds is a another big help. 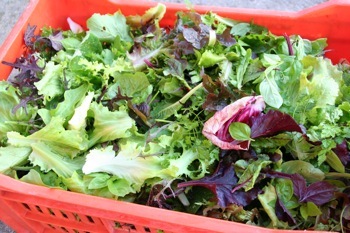 Autumn salads include Maravilla di Verona lettuce picked weekly and chicory hearts for later harvest. 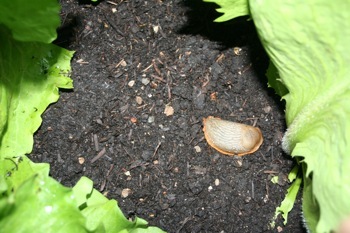 Their low leaves often hiding slugs. 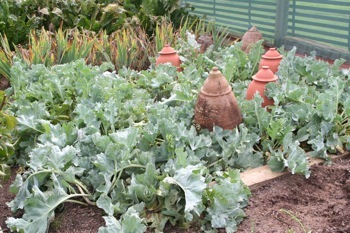 For these cabbages I left the outer leaves (damaged by caterpillar) on the soil. 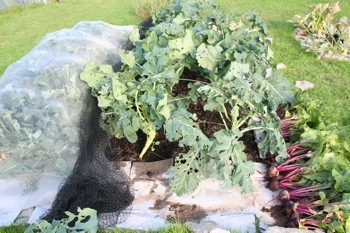 These purple sprouting broccoli had beetroot between. 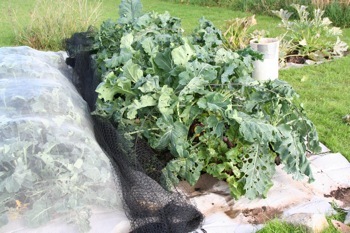 Harvesting all of them and removing the psb’s lower leaves revealed many slugs which I cut in half. 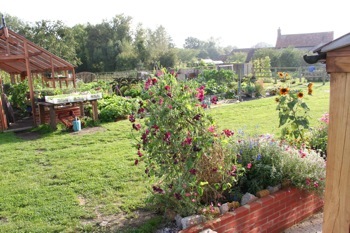 Steph and I visited a couple of interesting gardens in late September where both the owners were using a black, 6mm netting to keep butterflies and moths off their brassicas. It was working well, and looks much nicer than white mesh. 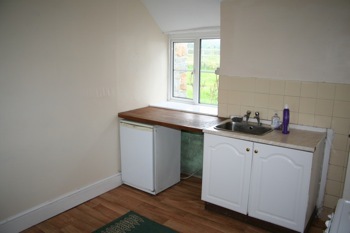 I tried some four years ago but it was wider than 6mm and butterflies got in. 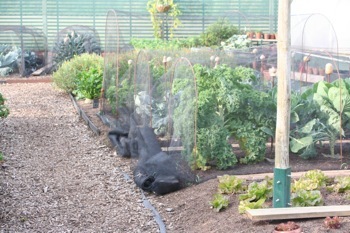 Black butterfly netting in Kate Stuart Smith’s walled garden, with potatoes on the right. Sarpo Mira still green and needing to be harvested. 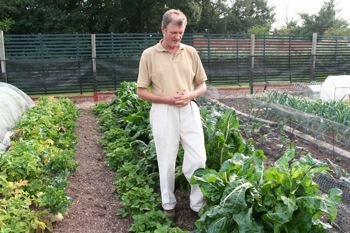 Richard Sandford is keeping cancer at bay with healthy, nutrient rich vegetables. Including the lima beans at right. These seakale are mostly in their first year, helped by a thick dressing of seaweed on the surface. Same with the tree-like asparagus. On both beds you can see no seaweed now. 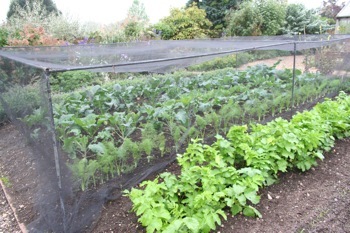 Brassicas are vigorous and healthy under their netting. Caterpillars have been awful here all summer and the pale green ones are still munching away, often disguised by their colour so you need to look closely to find and squash them, often after they have made large holes in leaves of any brassicas. This is the first time I have suffered bad damage to autumn salads such as rocket and oriental leaves, also to plants in the greenhouse such as land cress and pak choi. Fortunately after careful searching and squishing, most plants are regrowing, and I have also done fortnightly sprayings of bacillus thurigensis (bt) on some brassicas, which has been effective. Unfortunately it seems that bt powder is now hard to buy and I am unsure why. 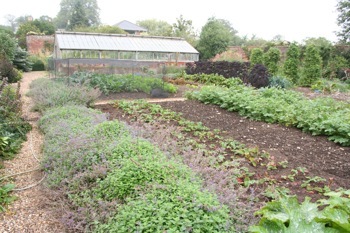 Everything you see growing in these beds is second plantings made in June and July, after clearing earlier harvests. 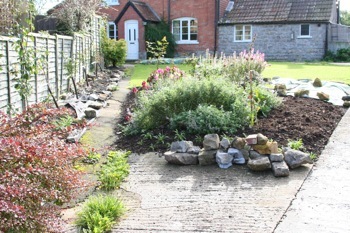 Dug bed on left has so far yileded 3kg less than the undug bed on right, from the same plantings. 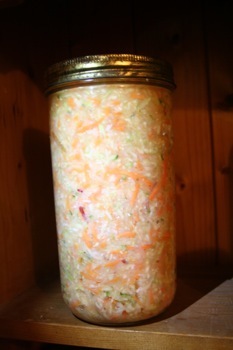 Kinchi, fermenting cabbage and carrot, cucumber, apple with just salt added. 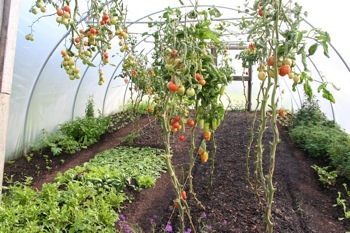 Inspired by Hans and Gaby Wieland’s talk at the giy gathering in Waterford, see www.theorganiccentre.ie where they run a thriving garden, courses etc. View from the road in late 2012. Along the fence on left are apple trees on small M27 roostock. Other plants between the trees have grown well. Day length is still shortening rapidly and I notice it in my weekly picks off the same lettuce plants, whose leaves are a little smaller and thinner with each successive picking. Endives are a good substitute now, because of their extra vigour and resistance to mildew, while oriental leaves such as the wonderful range of mustards are fully in season from now until April, with less insect damage than in summer (see photo below of my current salad mix). I never knew such a bad season for caterpillars and would have struggled without using some bt spray (a soil bacterium bacillus thurigensis), which I was lucky to find because for some reason it is currently out of production, I know not why. I used it three times in August and September, for example on some cabbages which had been turned to lace, and am now about to harvest small, firm and worthwhile hearts from them. If I discover more about buying bt I shall post it, and am happy to hear from anyone who knows what is going on. The plus side of caterpillar problems is that they happen in dry summers when slugs are less of a problem – do you remember how we all lamented the slugs last year, without enjoying the absence of caterpillars? In terms of slugs, I have been fortunate that my first year here has been dry, because the mulches to kill weeds (cardboard primarily) would otherwise have encouraged an explosion in slug numbers, from an already high level in the damp pasture. There are still more slugs here that I had latterly at Lower Farm and many evenings I cut a few by torchlight, also when lifting bits of old wood, under which they gather by day. Change is afoot: at this time of year the large slugs are starting to hibernate and it is turn of the small, slippery grey ones – such lovely variety! 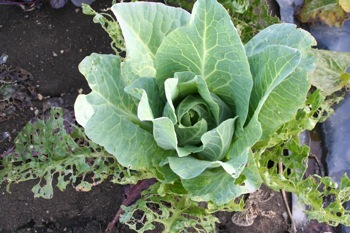 Filderkraut cabbage rising from its all-eaten leaves. 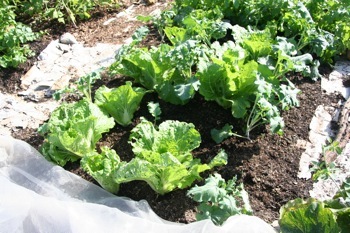 These chinese cabbage and psb went in late, in late August. I pulled back the mesh to weed and remove lower leaves, slugs. 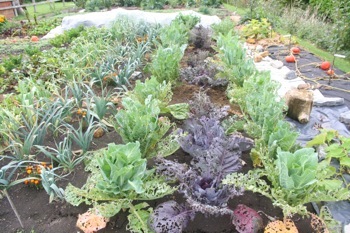 There is also diversity now in vegetables to harvest, with a plethora of colours and flavours. 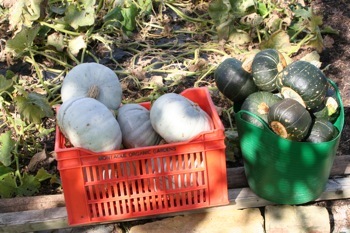 Winter squash have been more abundant than usual this summer: after harvest it is best to keep them warm (20-25C if possible) for a week or two, so they are fully cured before winter and then store better, wherever you have a spare space in the house. 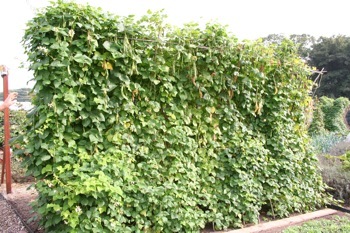 I am still harvesting dry and half-dry runner bean pods, of white-seeded Czar, which matures later than the borlottis. 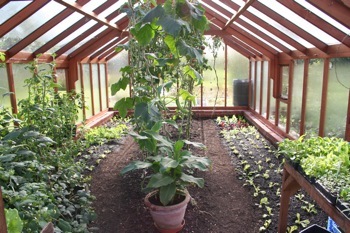 My conservatory has become a big drying store where trays of beans and bean pods jostle for space with squashes. I tried strings of apple rings in the windows but discovered that they more sun to dry them quickly before mould can appear, and I had to put them in the electric dehydrator, which has also dried more stevia leaves. Cabbage hearts, carrot, beetroot, celeriac, leek, parsnip, kale are all in season and can be harvested, or stand a while outside. 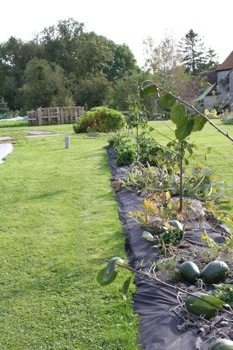 Before harvesting, from five plants in an 8m bed, two inches of manure on grass (in March) with biodegradable polythene, which bindweed grew through. I found plenty of Crown Prince and Buttercup. 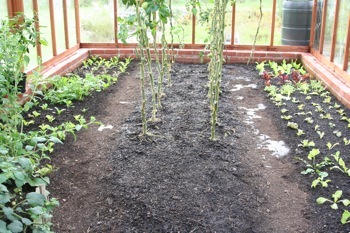 Trial, from left of minerals added to soil, biochar in middle and compost on right. Charlotte potatoes I kept from 2012 (on a windowsill, sprouting) were planted in August, harvested yesterday after blight got established. 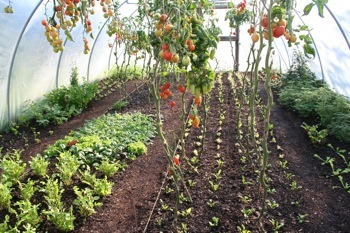 If you have a polytunnel or greenhouse, this is a busy time as summer crops finish and winter ones need to go in. I am pleased that almost all my tomatoes have ripened, with careful pruning and miserly watering to concentrate their energies into existing fruits. I pull their stems out gently, leaving most roots in the soil, then prepare the surface for new plantings by walking on it to break up lumps. Then the dry soil needs patient watering and initially the water runs off, until it is damp enough for capillary action to hold on to new water, ideally you would sprinkle a can of water every five minutes, until moisture is retained. 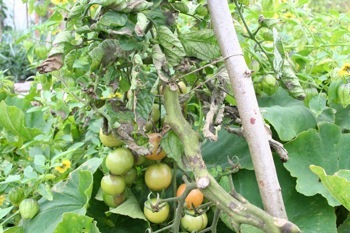 Last tomatoes in October, Sungella F1 on left have fruited well despite poor-looking leaves, while the Gardeners Delight on right has been the opposite – healthy leaves and less fruit, slow to ripen too until lately. 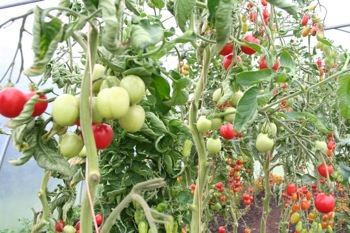 Flavour of both is average, compared to Sungold, Rosada and most beef tomatoes. 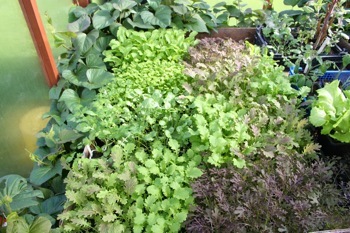 Greenhouse before sorting and with dry soil in middle bed. 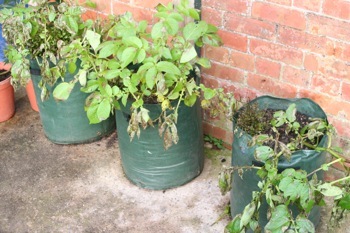 Just two cans of water was too much for the soil to absorb initially as you can see from it running into the paths. On October 12th after I cleared most tomatoes from the bed (some trusses hung from wires upper left). 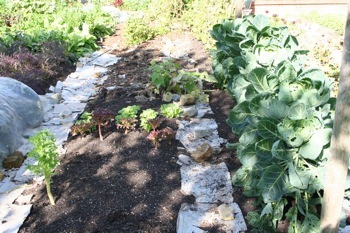 On 15th after planting salads for winter, including under the few remaining tomato plants. My salad plants are all bursting out of their modules so I have already cleared half the tomatoes, all basil, aubergine, most peppers and physalis, even though they would go on producing for a while, as long as there is no frost. It feels hard to pull up healthy plants but I have learnt from occasionally leaving them, to make more harvests, that one loses more from not planting what needs to go in now, than the small gains of remaining summer fruits and leaves. 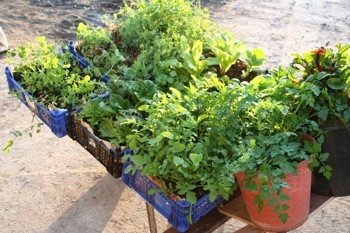 For example, salad plants that are in place before the end of October have time to make good roots before winter, and give some leaves in late autumn. A nice mix of autumn salad leaves, first radicchio and last basil. Mustard plants are elongating out of their modules, hence my desire for tomatoes to finish, or to plant around their stems. 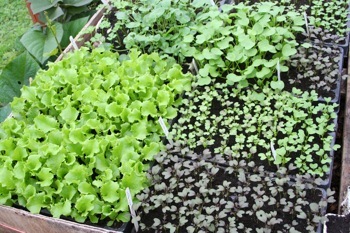 Bringing them all to my new greenhouse here in February this year, with lots to pick, after taking harvests already. 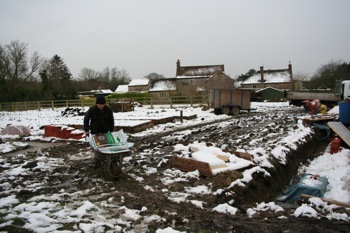 You could also sow carrots now undercover, then peas and broad beans in November and if in a cool, wet location it is good to plant garlic in a tunnel, even between winter salads, as it can establish while you pick salad through winter; garlic then grows fast after salads such as oriental leaves are pulled out in early May. This is main planting time for outdoor garlic: use your own if you have some, taking the larger cloves from your best bulbs; you may see information suggesting it is safer to buy fresh garlic seed but I feel there are commercial reasons for this advice and I have always grown great garlic from my own bulbs. 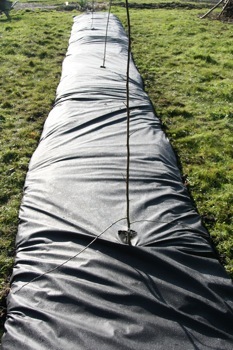 I plant cloves just below surface level and then cover the bed with its annual dose of compost, an inch or two. 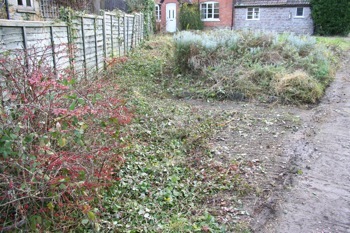 Clear residues and any weeds to compost heap, chopping stalks to 4-6 inches if they are long. 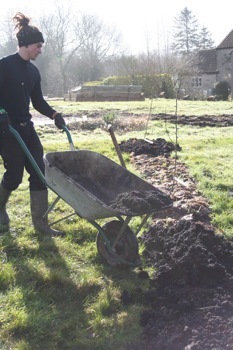 Then spread compost on the soil, and you are ready for spring. 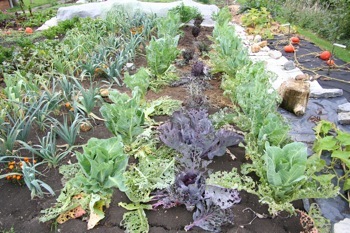 The value of homemade compost. 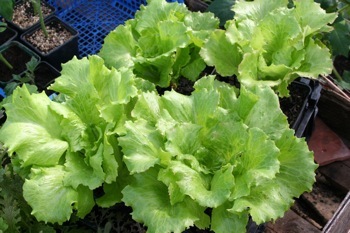 Lettuce trial with homemade. Cow manure in front, West Riding mid-back and green waste on right, before and after picking. Yield of leaves this pick was 46g compost, 45g manure, 24g multipurpose, 23g green waste. Worms will get busy, aerating soil during any mild weather as they feed on the compost, and it is fine at this time of year to use compost which is less than perfect, because winter weather will turn it into something nicer, especially frosts which can open up sticky lumps. 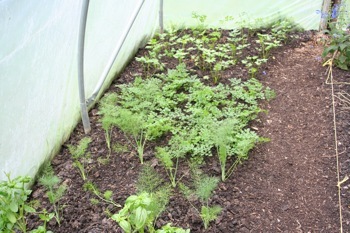 If your compost is full of weed seeds, these are easier to hoe in surface compost than in often-stickier soil. Hoe them when tiny, as early as March, and you kill thousands in a few minutes. One more hoeing in April, then occasional hand weed – just be thorough. A final thought on summer crops undercover: my sweet potatoes have been rampant and I had not before realised that they belong to the Convolvulaceae family, along with bindweed and morning glories. Indeed the tunnel variety has been flowering daily for months, most prettily. 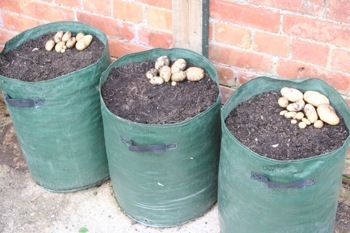 But with soil temperatures falling, harvest time is near – apparently the tubers grow little when soil temperature is below 18C, and they are certainly damaged by frost. I wonder about slugs! – more to follow in November, but harvest yours now! Green leaves of many kinds. Also we tasted baked squash of different varieties and the favourite was Kuri, partly I think because it is the most mature, hence sweeter and more creamy. 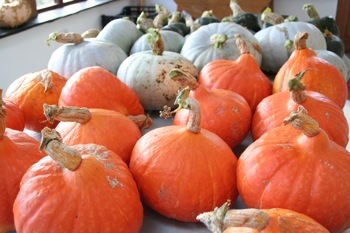 Whereas the Butternut was scarcely ripe, with a hint of marrow flavour, and Sucrine du Berry was also not quite there. Turks Turban had only a small amount of creamy flesh with an unusual and pleasant flavour. Then after lunch we tasted apples from the trees I planted six years ago at Lower Farm. They have been so productive this year, after time off in 2012, and it is fascinating to compare all the flavours. 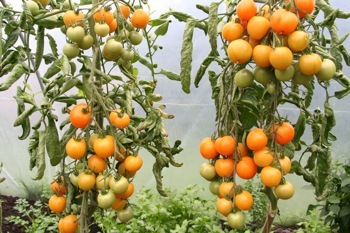 Most popular last week was Jupiter, which is just ripening now and offering lots of flavour in its enormous fruits. Cox, Red Windsor, Egremont Russet, Red Falstaff, Fiesta and Ribston Pippin are also eating well now, with many others to follow – all best harvested during the coming week, and I find they keep well in cardboard boxes lined with polythene, to stop them drying out. From November onwards, check for any rotten ones every fortnight or so. Between courses I use the conservatory table for drying squash. 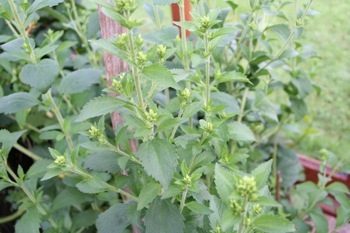 Stevia before a final harvest of its leaves, as it starts to flower. Article: Do you dig it?